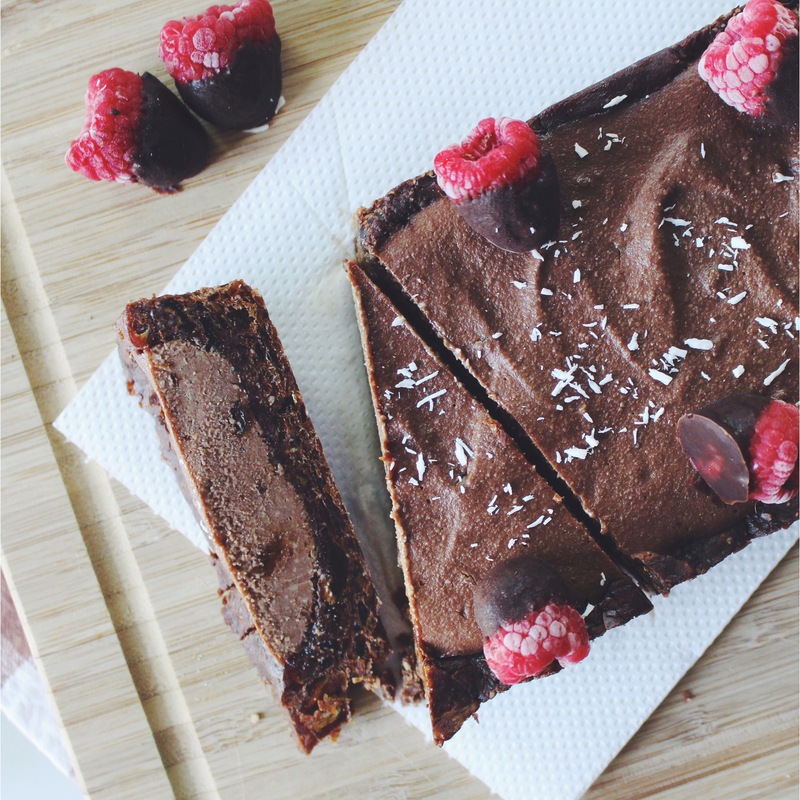 Chocolate and fruit go together like peanut butter and jam! I’m not sure why, but that flavour combination will always have a special place in my heart. Blend all “crust” ingredients together until thoroughly combined. Press mixture into loaf pan lined with wide strips of parchment paper. Ensure this layer is thick, tightly packed and evenly spread. Blend the “mousse” ingredients until smooth and creamy. Pour mixture into pan on top of crust layer. Level the mousse with the back of a spoon. Place pan in freezer to set for at least 1 hour. Start preparing the chocolate sauce to dip raspberries in by melting coconut oil (if not already liquid at room temperature), then whisking together with agave and cacao powder. Allow the chocolate to cool and thicken for 5-10 minutes. Dip each raspberry in chocolate sauce, place on a sheet of parchment paper, then place in freezer to cool for about 5 minutes. 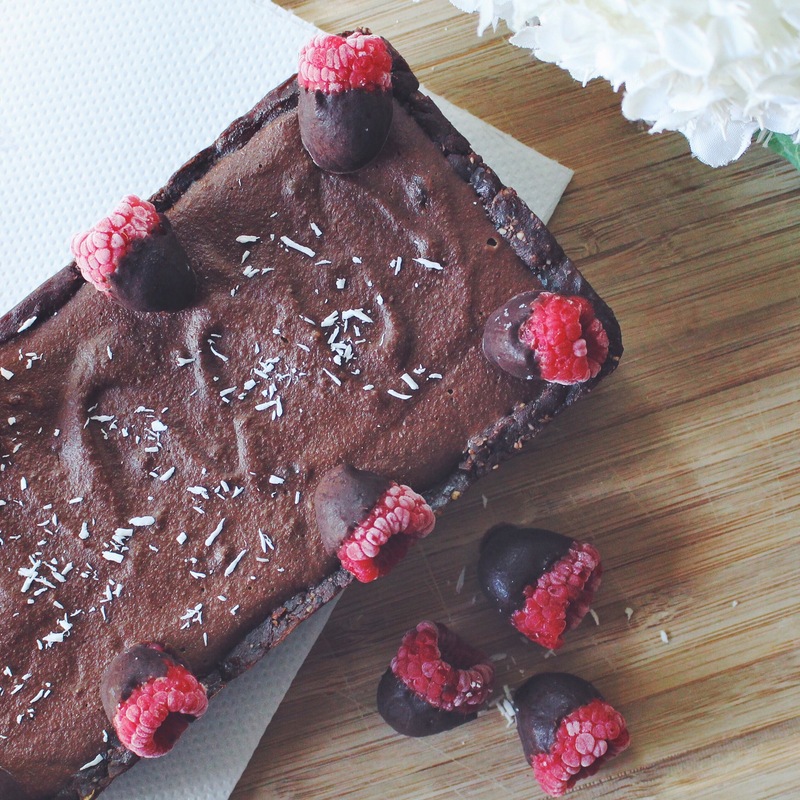 Place frozen chocolate-dipped raspberries on cake and garnish with shredded coconut if desired. Let mousse cake set in freezer for 2 hours, then thaw at least 1 hour at room temperature before slicing and serving. Enjoy! Makes approximately 8 slices.